Wednesday evening our family visited one of our favorite beaches, Jenness, in Rye. Although we had plans to go in the morning, all that changed when my daughter was called into work. That's okay though, it's was a gorgeous evening. On the right is my husband and I as we walked along next to the surf. It was a nice time for my husband and I to reconnect. His job has been rather stressful lately so it was good to . . .
wonder where the girls are . . .
Summer has been calming here in New England with long, hot, humid days. The kind of days that tourists, vacationers, and most natives love. Finally it seems to be cooling a bit, with daytime temps in the 80's, and the nights are downright glorious for sleeping. Fall is trying to creep in but Summer still has a tight grip. There's more to see from our beach excursion so if you'd like to come back tomorrow night I'll show it to you. Hopefully you've been able to languish near some water of your own recently. It's good for the soul. I'll be linking up this evening with Mary's Little Red House for Mosaic Monday. Won't you join in? Not much water here in the desert, so a visit to your blog has been as good as a vacation for me. How I envy that lady with the folding chair, sitting out in the water! 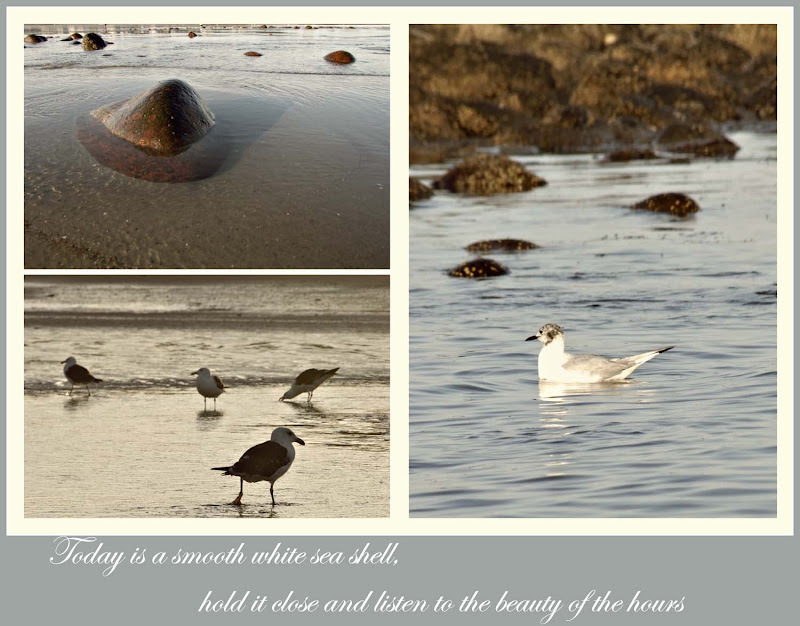 Beautiful, tranquil, summery photos--thank you for sharing with this parched soul! Wonderful pics. I can imagine myself there. I love Jenness also, and North Hampton Beach, and the one on Kittery point..is it seapoint? anyway lovely pics. I love when it's calm and empty like that. Beautiful photos! Makes me really wish I was there... I can never get enough of the ocean. 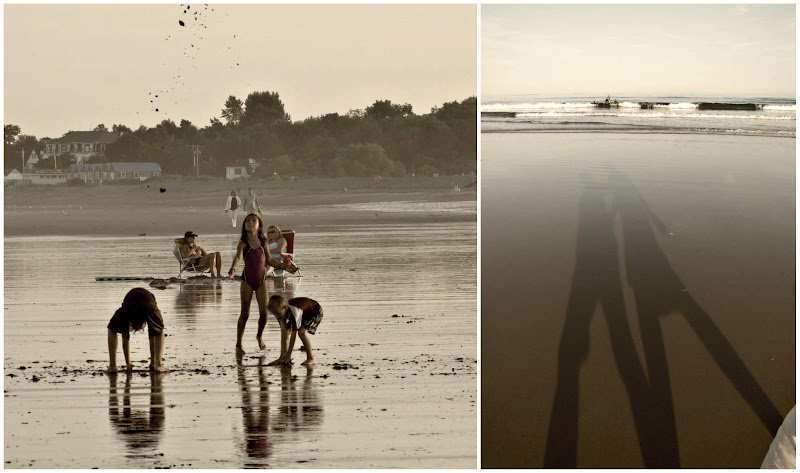 Love that picture of you and your hubby's shadows! Summer still has a huge grip on us - temps have been ridiculous at 100 plus heat indexes up to 110! Such soft, dreamy looking photos. Nice! Is this right down from Wallis Rd? Looks very relaxing to me, too. I was meant to live there. If only my father had moved back there after he married my mother! It sounds & looks like a perfect day. These are beautiful! But I might be a little biased because anything associated with the beach pulls at my heart's strings! We are water babies! Beautiful pictures, I can feel the calm! Wonderful scenes from the beach. Looks like a fun day. Love all the shorebirds. Lovely shots, peaceful and serene is right! I love shorebirds ... they are always so busy! Gorgeous shots! Just beautiful, looks like an amazing day! Sound like you had a fabulous time. Your photos put us right there with you. Hi, love your photos! Great shadow picture! Hope you have a wonderful new week! Calm is just what I needed this evening. I prefer the beach when it's still and quiet. 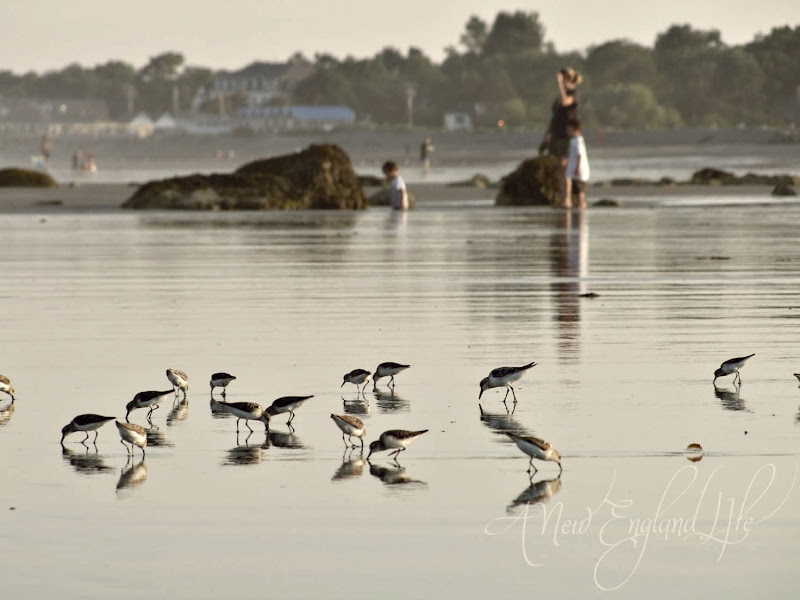 I loved your beach excursion - especially the photos of the sandpipers - gorgeous! What a peaceful and serene mosaic! Good grief! I just saw that my comment is you post title! I must need to go to bed! Stunning pictures of your walk on the beach. Take care and have a lovely week. Your mosaics are wonderful ... and really do create a peaceful, serene atmosphere. Absolutely beautiful pics, words too. Peaceful & serene, indeed... I'm sighing and enjoying your pictures... Thanks for sharing these beautiful scenes. Since I had to cancel by trip to the beach in July because of being sick, I really enjoyed these pictures and living vicariously through you. Sigh. So beautiful! I loved these photos, Sharon...just gorgeous and I am glad you put the one as your new header..well deserved! 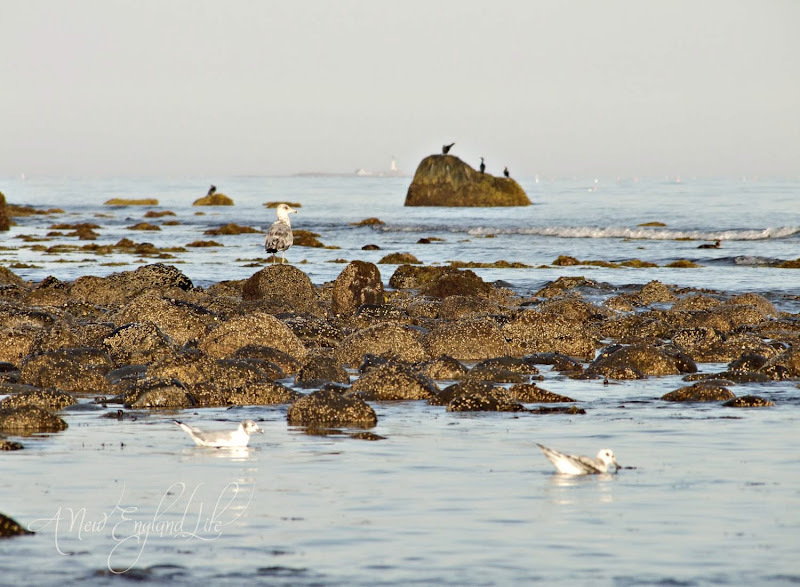 Are those Cormorant birds on the far out rocks? Beautiful photography Sharon! Don't you just love this time of the year? It's starting to cool, but not too much, and the angle of the sun makes for great morning and evening photography. Hmmm. I don't know which pic I like best. They're all nice. They all convey that warm, slow feeling that summer generates. I love the long, hand-holding shadows of you and your hubby. It conveys such sweetness. There is nothing as wonderful as a summer evening when the shadows are long. It is a reflective time of day, in more ways than one. Lovely and I look forward to more of your excursion. Water is quite abundant here on this little island. It soothes and calms me and makes the hot days more bearable. Oh what gorgeous light, Sharon!! !